Sometimes we receive requests for unique invitations for a business function or wedding - when a client has a limited budget but wants some sort of 'bling' on their invite. The 'proper', more traditional way of doing this would be to apply a metallic foil to sections of the invitation - it looks beautiful but it's an expensive process. So we came up with an alternative which is becoming increasingly popular. Enter: glitter glue. The secret is in the minimal application of 'dots' to avoid looking kitsch or home-made. A little bit of sparkle, carefully placed, just adds a little something special to an already lovely design. So next time you're wanting something a little bit over-the-top but not too much, and want to add a bit of bling to your invites, get yourself some glitter glue. Or, if we're designing and printing your invites, we can do the deed for you - because it can get messy. A slightly more expensive alternative to glitter glue is rhinestones which are sparkly little plastic 'gems' that can be glued onto sections of your design. Application is more tedious than glitter glue but it also gives an attractive finish. 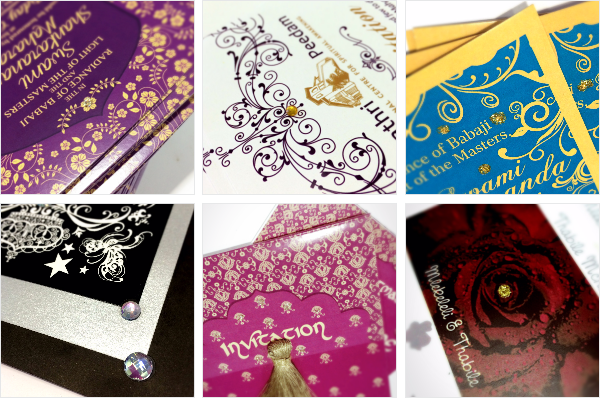 Here are some invites we've designed and finished off with glitter glue or rhinestones.